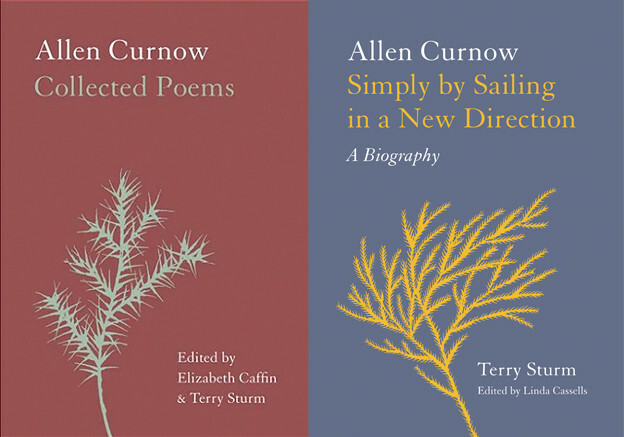 In 2010, Stanford University Press published The Collected Poems of Larry Eigner and the book’s faithful editors, Curtis Faville and Robert Grenier, had every right to expect both showers of attention and hosannas of praise. Though Eigner did not win any awards in his lifetime, he enjoyed a remarkable succes d’estime, first amongst the Black Mountain poets and then with the Language school. On top of the excellence of his own work, then, Eigner served as an important hinge between two very different, though related, strands of American avant-garde writing. 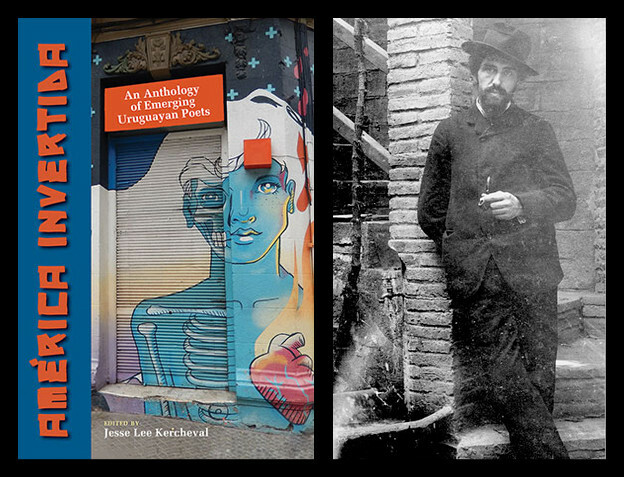 The Collected was a remarkable labor of extraordinary love. Big-boned and sumptuous, it brought together in four volumes over three thousand poems from over five decades. It preserved Eigner’s idiosyncratic spacing and reproduced the distinctive font of his 1940 Royal typewriter. But the Collected didn’t get the reception it deserved. There were virtually no full-length reviews. (I just checked the MLA bibliography and came up with just one. I tried Google. I came up with another.) In the end, it might be that the Collected was just too big. (Eigner once asked how much is enough. The Collected might have been too much enough for any one reader to digest.) While Eigner was not a particularly difficult poet as twentieth-century poets go, he was a particularly demanding one. In the end, a stretch of three thousand poems was probably just too exhausting for most reviewers. 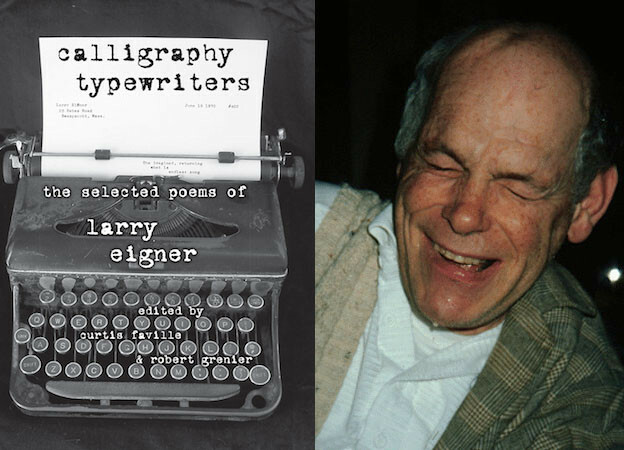 Calligraphy Typewriters: The Selected Poems of Larry Eigner weighs in at a mere (!) 334 pages and thus offers a less intimidating prospect. It is a lovely book to hold and to look at. It too reproduces the signature appearance of Eigner’s poems. It maintains their distinctive itineraries as they sally forth across the page from a lefthand margin to which they never return. The book is an essential introduction to Eigner’s achievement and allows us to begin to account for what he was up to. To say that these are lines that are hard to speak, or that one can’t quite imagine spoken, is not to say that they are not sonically patterned. The long “i” sounds in the first two lines (like, light, while, types) are indication enough that the ear is having a good time here. But as in many of Eigner’s poems, it’s the eye that is getting a workout — though, significantly, Eigner never actually uses the verb “to see.” The poem is constructed from atomic facts and forms a catalog of nouns and noun phrases. There are few verbs in the indicative here — things are happening, for sure, but agency gets blurred — and even fewer pronouns. The poem rushes by. Olson’s demand for speed is clearly at work (Olson: “keep it moving as fast as you can, citizen”), but what gathers momentum here is the sense of distances quickly crossed and then just as quickly juxtaposed (the rolled streets becoming hills). There is also a tremendous leap in scale (the city opening up to the sun-widened earth). Ordinary syntax has no place in the poem, because the movement outwards through things great and small, near and far, is not about orderly rows, but vast propinquities. This poem, like so many of Eigner’s poems, is about things stirring together. Now, it is tempting, though wrong, to write this poem off as a clever bit of trickery. Eigner has not forgotten anything: the poem enumerates shifting and widening perspective beyond the house — the roof, the aerial, the trees, and the sea. There is a nice ambiguity in the last line. Have the seas (the plural is an interesting touch) fallen beyond the horizon itself? Well, yes, because Eigner cannot actually see any of these things. The color upstairs is upstairs. The aerial is obscured by the roof, which you cannot see from the inside. In this way, the poem is not clever or whimsical. While Eigner does not forget the aerial at the moment of writing, the present tense of the poem is not about this moment, but about a continuous habit that the poem breaks. The moment of writing is a coming to consciousness of a form of habitual unconsciousness. The point of the writing, then, is to remind of what, downstairs, we tend to forget — the existence of the upstairs, of the outside, and of the broadening set of frames that is the world. The debt to Williams’s fire engine with its “figure 5 in gold” is clear, though Eigner’s “of course” threatens to sink the poem with a cute little paradox. Eigner sometimes shows the kind of whimsicality that marks the Beats’ appropriations of Buddhism, but I don’t believe that Eigner is merely playing with paradoxes here. He is making a rather serious point. In our world, the water system does go together with the sunlight. In fact, that going together is precisely our world. The two are inextricably, though distantly, linked. They are mediated by the phantom totality that his poems attempt to delineate. If we take his poems together — in their full sweep in the Collected or in the more concentrated dose of Calligraphy Typewriters — we can see that they are more than a diary of a man who was able to devote his life and talents to poetry. They piece together — bit by particular bit — a map of cosmic immensities. For all the audacity of that project, Eigner’s work is disarmingly humble. Malebranche claimed that attentiveness is the natural prayer of the soul, and there is more than a touch of the Zen master to Eigner’s care for the everyday and for the apparently inconsequential. After that, there is really nothing else to say. 1. Larry Eigner, Calligraphy Typewriters: The Selected Poems of Larry Eigner, ed. Curtis Faville and Robert Grenier (Tuscaloosa: University of Alabama Press, 2016), 110. 3. Larry Eigner, “not/forever/serious,” in areas, lights, heights: Writings 1954–89, ed. Benjamin Friedlander (New York: Roof Books, 1989), 25. 4. Ralph Waldo Emerson, “Experience,” in Essays and Lectures (New York: Library of America, 1983), 479.